← Become a Friend of Vernon Park this Fall! People’s Poetry Festival in Vernon Park this Saturday! This festival promises to be uplifting, yet relaxing for the whole family. We have an all star lineup of poetry and jazz, and I am sure you will enjoy the festivities, as a robust vendor marketplace will help to adorn the beautiful park scene. This year we are honoring poet, professor, civil rights activist and Black Arts Movement icon, Askia Toure with the “Living Legend of Poetry” award, and we are fortunate to have sister Sonia Sanchez help us in presenting this award. 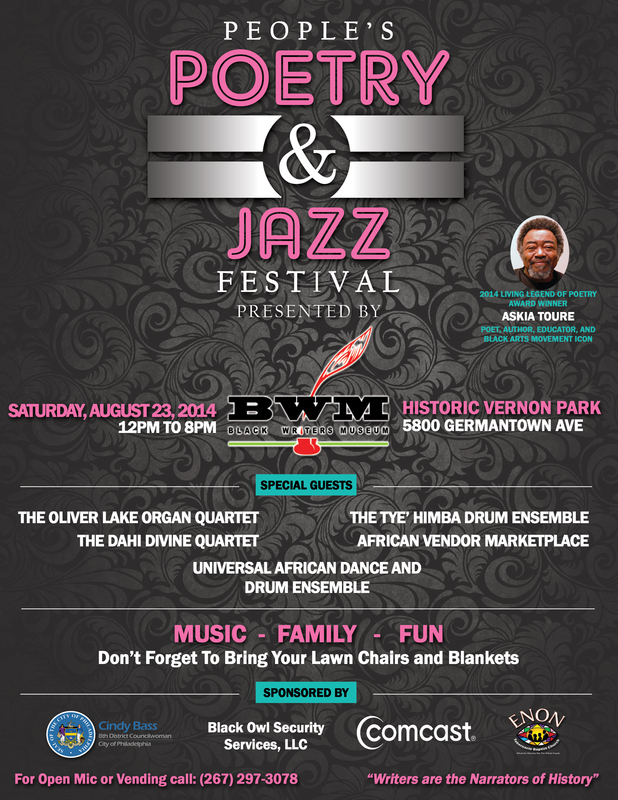 Live jazz will be provided by the Oliver Lake Organ Quartet and the Dahi Divine Quartet. The Universal African Dance and Drum Ensemble and the Tye’ Himba Drum Ensemble featuring Muhammad Silla from Guinea, Africa will add on some positive rhythms that will move the soul. We look forward to a very big and beautiful day in the park. I hope you can make it.